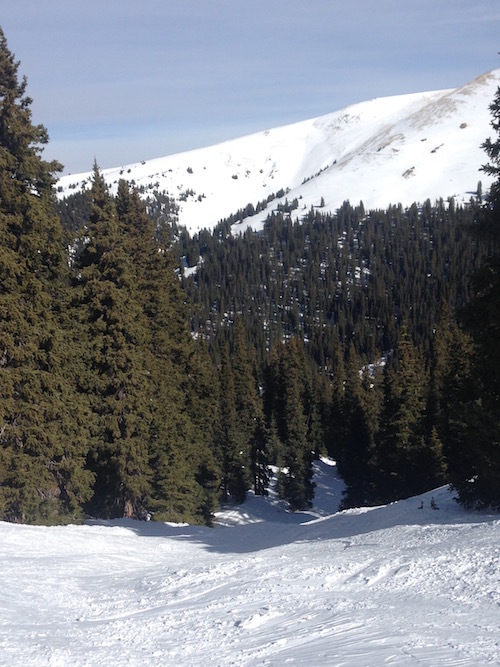 It’s been a long time since I’ve skied in Colorado. Eight years, in fact. But when my husband was invited to do a reading at the University of Northern Colorado, it seemed like it might be time to return (he’s a novelist. You can find out more about his books here). And am I glad we did! 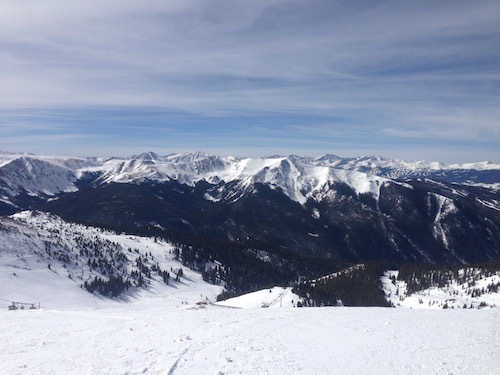 We just spent a few happy days skiing at Keystone and A-Basin. Sure, a lot of you are familiar with these mountains. 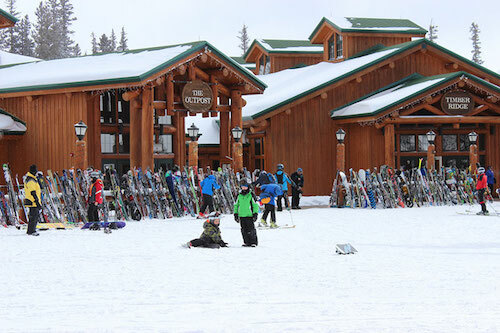 Both are associated with Vail Resorts (Keystone is part of the Vail family, A-Basin has a lift ticket agreement). And both are destinations, not only for skiers in Colorado, but for skiers all over the world. But for those of you who haven’t been to either of these places, let me give you a brief run down. Because even though they’re different, each one has its own distinct personality. 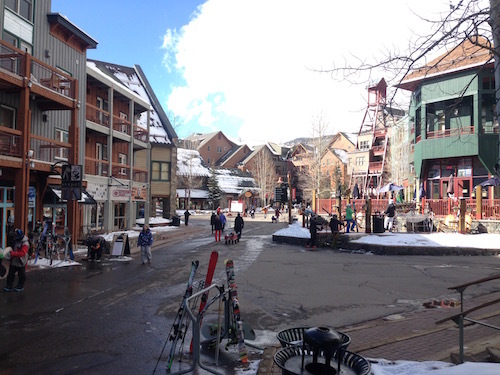 Keystone is a Resort with a capital R. There’s lots of slope side lodging, restaurants, and shops. There’s a spa, an ice skating rink, snow tubing, and night skiing. And though I’ve heard a lot of people disparage the artificiality of the base village — that it’s not a real town, like Breckenridge or Aspen — I have to admit, it was awfully convenient. We were visiting without a car, and it certainly made life easy. Everything we wanted was right at the base. And if you need to go somewhere, there’s free bus service that’ll get you just about anywhere. Now on to skiing. 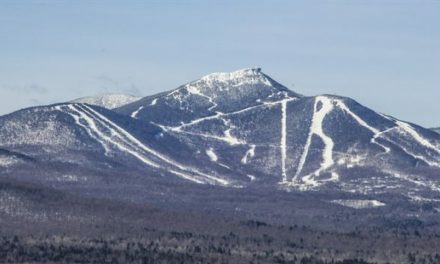 Keystone is comprised of three peaks — Dercum, North Peak, and The Outback — one behind the other, each connected by a series of trails and lifts. The first one, Dercum, has lots of long, rolling blue groomers. You can reach the top by either by a gondola or a high speed lift; both drop you off at essentially the same place, beside the lodge. Dercum is also the home of the resort’s terrain park and kid’s learning center and programs. Check out the snow fort at the top of the gondola. A kid’s dream come true! 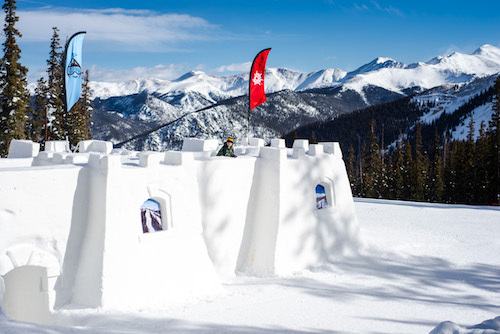 Snow Fort, photo courtesy of Keystone Resort. 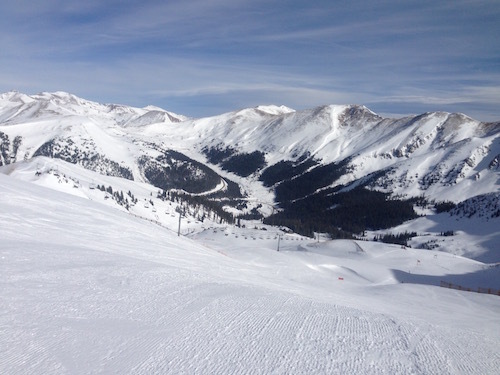 During the two days we skied Keystone, we managed to spend time on each of the peaks. On our first morning, it snowed like crazy. We picked up about 4 inches which really made for a great day. In addition to Dercum, we also skied North Peak (you can ski or take the Peak-To-Peak gondola), where we had lunch in the Outpost Lodge. Keystone also offers dinners there year ’round featuring a Bavarian theme. Here’s a view of the chutes we did on The Outback (I think it’s the Victory Chute). A friend who instructs at Keystone brought us over to this section of the mountain, and I’m glad she did! It was loads of fun. 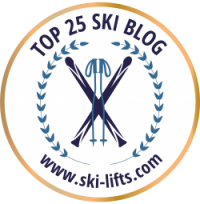 • If you want to extend your ski day, you can. Some of their lifts remain open until 8 PM Wednesday through Saturday. • Keystone offers snowcat rides into the resort’s back bowls for only $10. • Keystone as an amazing kids program called Kidtopia. You can find more info about it here, but it’s a program that’s packed with activities for families and kids. Literally, there’s something going on every single day that’ll make the little ones happy. It’s part of what makes the resort so great for families. Where Keystone is a resort with a capital R, A-Basin is pretty much the opposite. And that’s what gives it its own special charm. Here, the focus isn’t on fancy lodges or luxury amenities. There are no slope side condos or fancy restaurants. Yeah, the lifts are kind of slow and the vibe is kind of chill. But there’s lots of terrific skiing, and face it, isn’t that what we came for? The inside of the lodge. 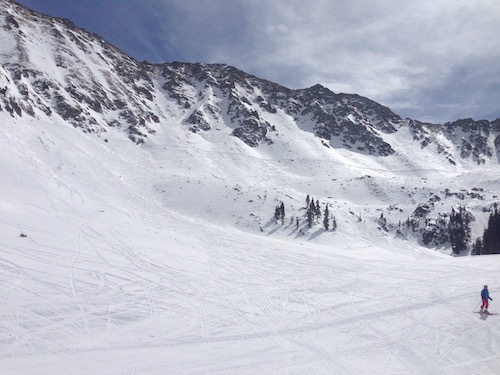 A-Basin is known for its spectacular scenery, gnarly terrain, and long season; it typically opens in late October and closes in June. And though the resort is known for its cornices, you don’t have to be an expert to ski here. There’s lots of great intermediate cruising, too. Nonetheless, if you want more advanced skiing above the tree line, you’ve come to the right place. Not sure where this is, but it sure is pretty. One caveat for people coming here from the flatlands: A-Basin is HIGH. For someone from the East, the elevation takes a bit getting used to. I followed the tried and true: no alcohol, plenty of water, and no caffeine, and yeah, I was still light headed and easily winded. Just know that this is pretty normal and will dissipate over time. 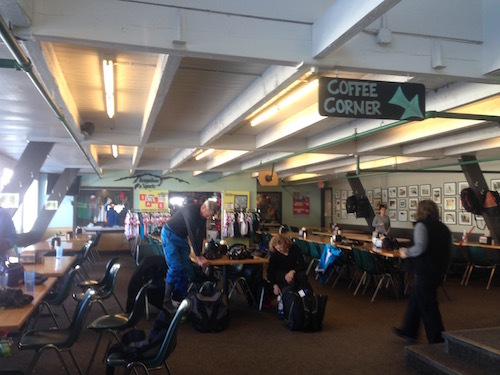 Fun fact about A-Basin: The current A-Frame lodge in the base area was once a missile testing facility. Would I recommend one over the other? It depends what you’re looking for. Me, I like to mix it up a bit. It’s all good. You won’t go wrong with either. 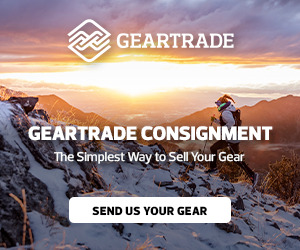 PreviousTaking your gear from here to there. 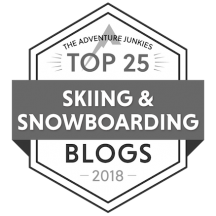 NextWhy do a women’s ski trip? If Ski Areas Had Honest Slogans. Hey, just an FYI- A basin is not part of Vail resorts. They have a pass sharing agreement, but are independently owned. Thanks, Anne! I knew that; just an oversight on my part. It’s been corrected.